One hundred fifty school kids from Pili, Camarines Sur will be receiving a bike to school from Bikes for the Philippines Foundation, San Miguel Foundation and the Department of Education (DepEd), during bike turnover ceremonies at San Vicente National High School in Pili, Camarines Sur on 15 May 2017. Bike beneficiaries would walk for as long as two and half hours to get to school. They would wake up as early as 3 am so they can get to school in time. By being part of this program, student beneficiaries can save as much as Php28,000 in school allowance money and more than 720 hours of transportation time. Through the bikes they would able to save for needed expenses in school and spend more time at home for house chores and homework. 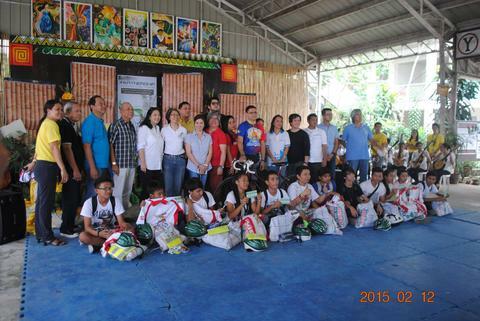 Angono, Rizal — At the Regional Lead School for the Arts in Angono, our beneficiaries are 13 former out-of-school youth. Most of them are over-age for mainstream public school and are now specialising in visual arts instead. These kids are from low-income households, and most of them are either sole bread winners or helping to augment the income of the family. Despite the difficulty in coming to school, they made a major decision to resume their education. These bicycles will help them save on jeepney or tricycle fare to school. They could make better use of their time – getting part-time jobs instead of walking or queueing for a ride, or helping their parents at home. Maribojoc, Bohol — After the program was delayed by the double setbacks of the magnitude-7.2 earthquake and Typhoon Haiyan, the student beneficiaries of Pagnitoan National High School (PNHS) were finally able to take their loaned bikes home. The students completed 8 days of training with the help of BfP volunteers Allan Bastasa and Carlton Styron. As the final step, the students were accompanied home and then accompanied to school the next day to make sure they were ready. They were also given t-shirts donated by Bikes for the World. It used to take 3 hours for these students to walk to school. Now it takes only 1 hour. After this first batch of beneficiaries, more students from PNHS are waiting for their turn to train. Baclayon, Bohol — The BfP beneficiaries were invited to join the parade for the 416th Baclayon Foundation Day. Here they get to practice the lessons taught during training – Balance and Control, Tire Repair, Stop and Go, Shifting Gears, Standing up, and Riding a Hump. Baclayon is the pilot location for BfP. The experience here has served as the basis for improving the implementation of the organization’s programs in other towns. Baclayon, Bohol — This is Lake Tiray. For some of these students, it is the first time they have seen this lake even though it is literally in their backyard. With their bicycles, our beneficiaries have gained mobility. And with that mobility, comes education. 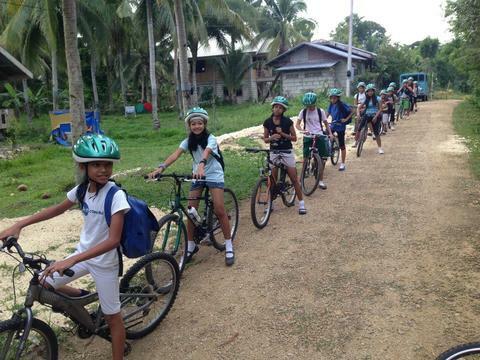 Baclayon, Bohol — Bike beneficiaries of Baclayon National High School just before a community ride. These rides are important for the beneficiaries to experience actual road conditions. They can practice their lessons on traffic rules and regulations as well as proper riding techniques. We also hope that by learning these rules early on, we will have a new generation of better, more responsible drivers. Maribojoc, Bohol — BfP encourages mentoring amongst bike recipients as a way of paying it forward. Older year levels and siblings teach younger students how to ride properly and maintain their bicycles. Riding together for the first time, these are students from Pagnitoan National High School (PNHS) and Baclayon National High School with the third batch of Grade 8 and 9 candidates beneficiaries from PNHS. The success of the BfP program begins with the desire of teachers, faculty, and staff to give their underprivileged students and SARDO’s (Students at Risk of Dropping Out) a better chance in life. Like us, they see the bicycle as an asset that helps a child fulfill his potential and allows him faster, safer access to education. BfP Program Director Joel Uichico is pictured here with Baclayon National High School (BNHS) guidance counselor Marie Mae Alcuizar-Briones (L) and former principal LV Jabonillo. Under Maam LV’s leadership, BNHS became the first ever beneficiary of BfP and its pilot program. She is now the principal of two schools situated in the 5th class municipality of Cortes, Bohol. In a few months’ time, she will be leading the BfP program there, too.